The Catholic Story » Blog Archive » What is Ascend About? « Join Us for the Launch of Ascend! We could say lots about what’s in Ascend, but the proof is in the words. A word cloud is a visual analysis of the most frequent words in a given text. 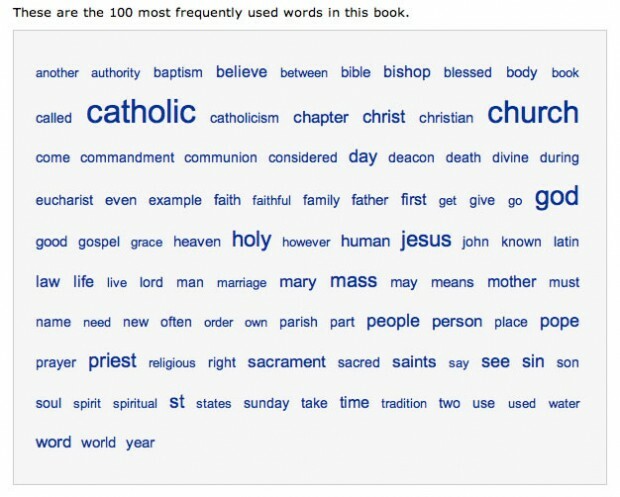 Amazon offers word clouds for books, but unfortunately their text analysis tools are down now for new books. 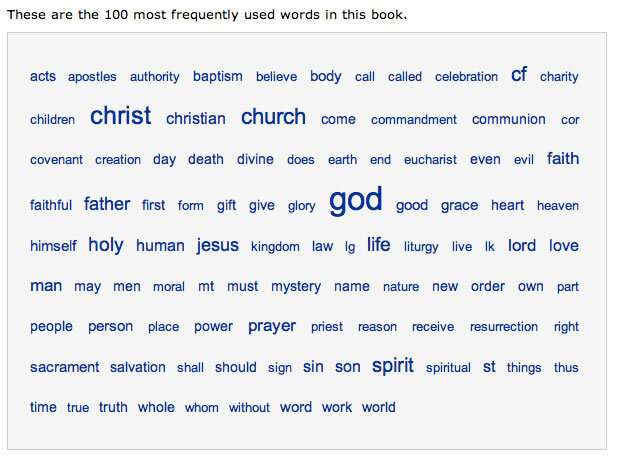 Luckily, I was able to feed the entire text of Ascend into a word cloud tool at wordle.net, which output a visual analysis of the most frequent 100 words in the book. The more often a word is used, the larger it is. We don’t think you’re a dummy or an idiot. And you probably don’t want to sit down and read a reference book. That’s why we wrote Ascend—for you! This entry was posted by Deacon Eric on Thursday, October 22nd, 2009 at 10:01 pm	and is filed under Ascend. You can follow any responses to this entry through the RSS 2.0 feed. You can leave a response, or trackback from your own site. Oh – that is good, really good… the wordle so goes with what this book is about. I am busy reading the book – and writing about it. More to follow. Congrats, best wishes and mazel tov to you for this publication. I have just received my 3 books of Ascend, that I plan to give to my son and nephews for Christmas presents. I was worried that, since they didn’t have 16 years of Catholic education (like me!) they would not understand the beauty, depth and breadth of Catholicism. I am thrilled with the book, and think I may have to order another one for myself. It seems that there is so much that has happened in the last 35 years to color how Catholicism is understood in the “mainstream” that I am very grateful for this book. It is the real deal! THank you. 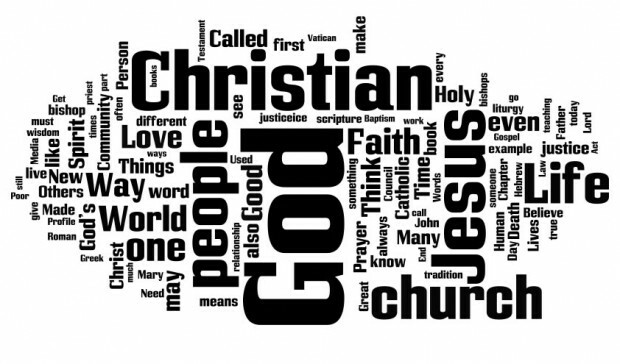 This is fairly off topic, but I love the word cloud! And I’m a little ashamed to admit I didn’t know about it (and that’s the kind of little stuff in this world I so enjoy). This book is new to me, but sounds well worth buying. And I’m seriously considering getting it for a friend of mine, with whom I taught Confirmation with for two of my 3 kids. Our kids are now all confirmed, but she continues to work with younger people much more than I do. She’ll love it! Another book to consider is Animals in Heaven? 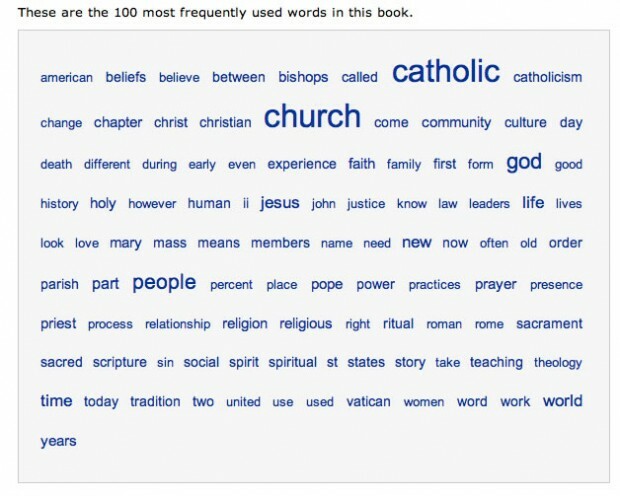 Catholics Want to Know!” by Susi Pittman. Certainly it’s a book for those who love animals and all things natural — and it has some interesting and surprising looks at Church history of saints and the animals.